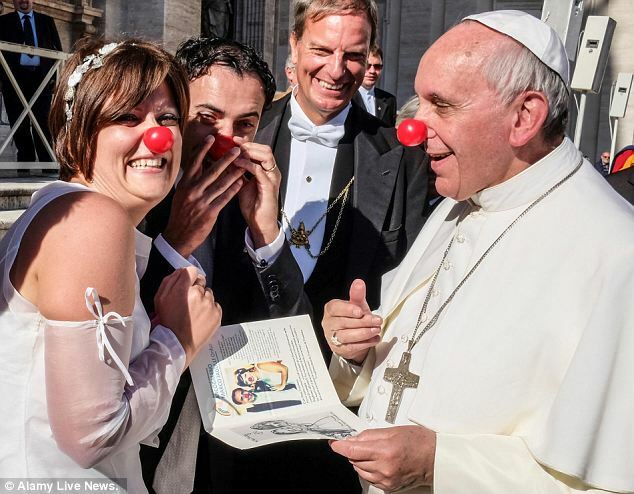 Pope Francis clowns it up as he congratulates a newly married couple in Rome. Pope Francis is (most likely) coming to Philadelphia in 2015 and many Catholics are already offering their welcome to him, as well as an invitation to advance LGBT acceptance in the church. Segal believes that dialogue will help bridge the divide within the Catholic community and between the church and LGBT communities, helping to heal wounds and make amends–and ultimately to promote stronger, more fruitful family life. Indeed, America’s bishops have not ceased opposing marriage equality, even as several anti-LGBT campaigners admit it is a lost cause. There is a troubling rise in the firing of LGBT church workers, as more come out publicly and get married. Theologian Massimo Faggioli is quoted in Gehring’s article saying that the US bishops “are the most difficult team Pope Francis has to work with because sociologically and culturally the are in a different place.” To change the conversation on marriage and family life, Pope Francis will have to challenge the US episcopacy’s status quo. It will not be easy, but his first year has proven that this is not just any other papacy. In terms of messages, policies, and gestures, what do you think the pope will do at the meeting in Philadelphia? What do you think he should do? Where do you think he should visit not just in Philadelphia, but anywhere in the United States? Who do you think he should meet with? What are your hopes for the World Meeting of Families? What are your fears? Offer your answers to these questions and other reactions to the opinions expressed above in the “Comments” section of this post. I certainly hope he makes it to Boston, where the American Revolution began! Although it’s a small state, Massachusetts has two major Jesuit educational centers — Holy Cross (my own Alma Mater), and Boston College, which is actually a full-fledged Catholic university. And along the way, I don’t see how he could avoid stopping at Catholic University in Washington, and Fordham University in New York. He can expect (and probably predict) a fabulous “Rock Star” welcome in all of those places — while his predecessor Benedict would not have been welcomed very kindly, to put it mildly. Encouraging thoughts. I think he should visit the US/Mexico border and meet with all the Border Patrol officers of Mexican heritage who profess to be Catholic. He could explain the morality of emigration and just what “love one another” might mean in this context. My family would be overjoyed if he would baptize my granddaughter (ETA on her: January 23, 2015). Both my daughters are lesbian and married. My youngest daughter and her wife have a daughter and son. This is the first child for my oldest daughter and her wife. It would give the Vatican’s message that the LGBT community is part of the RCC more authenticity. Post-clown nose anything is possible!